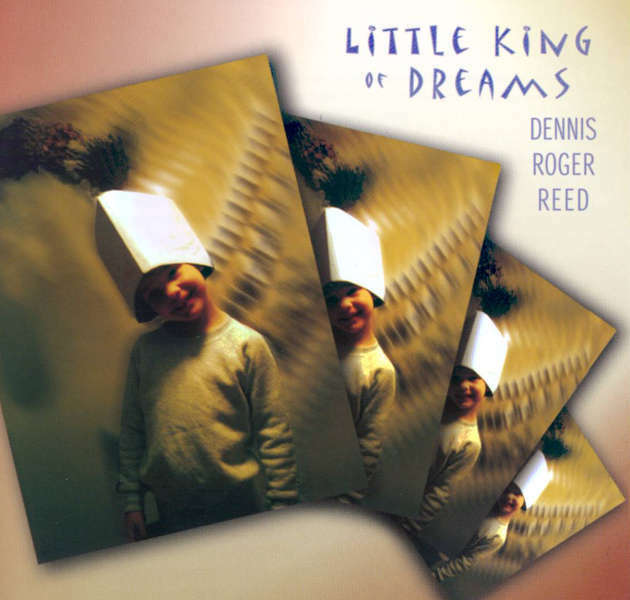 Years in the making, with a cast of thousands, "Little King of Dreams" is composed of fifteen original songs by Dennis Roger Reed with an acoustic folk rock touch. The cream of the crop of Southern California folk and bluegrass musicians help make this a very special project. Among those are the Andy Rau Band, with Andy co-writing two songs; Paul Shelasky; Janet Beazley; Don Reed and many more. Prior to "Little King of Dreams," Reed recorded two albums as the bass player, secondary songwriter and high harmony vocalist for the Andy Rau Band. He's had songs published and recorded in the Nashville, bluegrass and blues markets. "Little King of Dreams" is a production that features elements of country, folk, bluegrass, swing, rock and blues. "Patience, patience, good things still come to those who wait" goes one of many lilting refrains on this fine collection of acoustic folk-rock and country music. One hopes that's true for Dennis Roger Reed, the San Clemente singer-songwriter who has played for more than a decade on his own and with a variety of local folk, rock and bluegrass bands. This CD probably won't establish Reed as a big performing star, or even as a touring cult favorite. His pleasant-but-slight voice lacks the shine for that, although it's more than enough to do expressive justice to his strong lyrics and melodies. But if he can get "Little King of Dreams" into the right hands, Reed deservedly could join the list of songwriters who are sought by artistically alive country singers and smart folkies looking for good material. "Little King of Dreams," Reed's first CD, gathers some of his best songs from over the years, and brings together a small gang of his longtime playing partners to back him. Everything gets lovely treatment with mandolins, fiddles, Dobros, banjos, and expertly played lead acoustic guitars (Reed plays rhythm guitar and bass). Several tracks marshal a more rock-oriented lineup with drums, piano and organ–all played by one very adept musician, Tim Horrigan, who plays with Reed in Blue Mama, a roots-music band. The patience of fans who could see Reed's worth in live shows, and on two previous cassette-only releases, is well-rewarded here. As it turns out, he is setting up what amounts to a well-designed, loosely linked concept album in which themes of love and small-town living are entwined. The two closing songs, "Gray Prairie Dawn" and "Rain on the Rails," are contrasting bookends to the chirpy optimism of "Panama Lane" and "Patience." Love has eroded, the narrator's face being left alone in their Nowheresville towns, and their prospects look as bleak as those of depopulated, rural America in general. While Reed lacks the vocal stature of his influences, he doesn't have to make any excuses for his singing. He is gently in command throughout–except for "Our Last Good Kiss," a fine anthem about an adulterous affair, in which the country-rock arrangement overpowers his voice. He has simple stories to tell about the raw feelings of people who hold tightly to tenuous strands of love, or who see the need to let go but can barely face it. His style keeps alive vestiges of a rural past that nearly all of us have let go because, as much as we romanticize it, we prefer a more exciting, bountiful and convenient life. After his opening feint toward nostalgia, Reed proves too clear-sighted to pretend that a loving, harmonious small-town Eden can be anything but a vanished dream. "Little King of Dreams" Songwriter Dennis Roger Reed draws upon his years growing up in rural Southern California as the inspiration for most of his writing. He sketches little short stories about the difficulties of earning a living and keeping a relationship going in small farming and desert towns. Most of his characters aren't leading happy lives; work is hard, and love just keeps finding a way to slip just out of reach. But they survive despite their problems and hope tomorrow will be better. Reed gives most of his songs a contemporary bluegrass backing (banjo, Dobro, fiddle, and mandolin) but combines that with standard bass and drums, as well. An honest and refreshing collection of songs about real people. Dennis Roger Reed writes mature, intelligent folk songs and is quite skilled in their performance. 6. Dennis Roger Reed, "Little King of Dreams" (Plastic Meltdown). One of O.C. 's best song-crafters came up with this warm, winsome, quietly acoustic collection of Gram Parsons-like countrified folk songs about small-town romance. Without being explicitly social in his themes, Reed sings a cohesive elegy for the fading of rural America and a vanishing way of life. He has a scratchy but tuneful tone that can recall folk-rocker Peter Case's more subdued moods, or parallel the broken, reedy sound of Jerry Garcia. The songs offer lovely melodies and uncommonly intimate expressions of hurt. This is a very fine recording. The music has a relaxed yet lively feel, backed with the pure clean sound of American stringed instruments. Reed's songwriting has an immediate appeal, inventive and catchy, its message clear and plain-spoken. It's California with a Nebraska sensitivity. I'm always on the lookout for new music–on the show I play bluegrass, newgrass, new acoustic music, a little acoustic swing, some old-time tunes, and anything else that might happen along. It's refreshing to find an album whose sound fits the show and yet sounds different from everything else out there. Dennis Roger Reed is one of Orange County's unheralded treasures. In "Little King of Dreams" (Plastic Meltdown Records), he dissects romantic entanglements and laments the loss of simpler times. The splendid 15-song collection, featuring a stellar supporting cast of local players, is rich in American music, roaming freely among country, folk, bluegrass, swing, rock and the blues. By Jon Hartley Fox, Bluegrass Unlimited. Dennis Reed is a singer with an ironic delivery that is occasionally reminiscent of the late Steve Goodman. Dennis Roger Reed" has an earthy quality to his voice that helps "Rain on the Rails" blend into the bluegrass format.